Exchange 2010 allows auditing of administrative actions. All actions can be audited or just specific cmdlets and parameters. To enable Audit Logging open the Exchange Management Shell and run the following commands. Audits just the parameters that have Database, all parameters with *Address*, begins with Custom, ends with Region. All auditing is sent to the mailbox of AdminAudit. All of the commands can be run on a single line if you prefer. 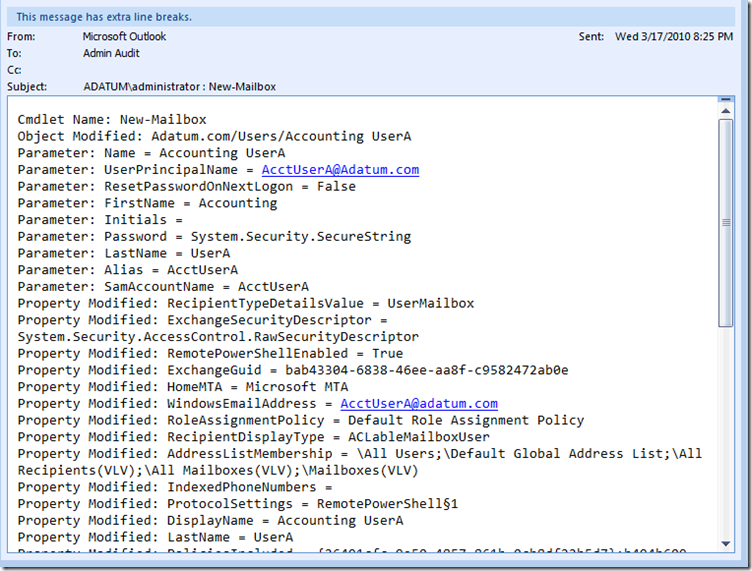 After creating a new mailbox by either using the EMC or the EMS, an email is sent to the AdminAudit Mailbox. Make sure the Mailbox is secured appropriately and archive or delete the mail after a specified amount of time. A command Set-AdminAuditLogConfig –AdminAuditLogAgeLimit DD.HH:MM:SS is not available for the RTM release of 2010 so be sure to watch the size of the mailbox. Below is a screenshot of the message sent to the AdminAudit Mailbox after creating a new Mailbox and User. Microsoft officially announced that May 12th, 2010, is the launch date for SharePoint 2010 & Office 2010. In addition, they announced their intent to RTM (Release to Manufacturing) this April 2010. ISInc has a SharePoint 2010 First Look clinic scheduled for April 8, 2010. Please visit here to register!